Knop Lake S.F.A. is comprised of 50 acres north of Co. Rd. 650 S near Pyrmont. Enjoy fishing, canoeing (creek and lake), picnicking and restrooms. No motorized boats allowed. Canoe access is on the left bank. Parking: There is parking for about 20 vehicles at the turnaround by the river. There is no parking allowed on the grass. 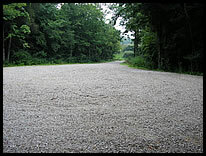 Path to River: There is a short carry down medium grade rock/dirt terrain to the creek. River Access: There is room to load/unload 2-3 boats at a time. There is plenty of room to linger while dealing with boats or shuttling the vehicles. There is no camping at the Knop Lake Public Fishing Site, and off-road vehicles are not allowed. 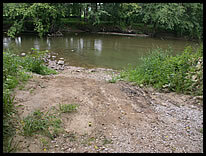 The access site is operated by the Indiana Department of Natural Resources. For rental canoe and kayak trips on this section of the river contact Wildcat Canoe and Kayak Too.